Taoist Chinese believe that during this period the Gates of Hell are opened and the souls of the dead are free to roam the world of the living. The Hungry Ghost Festival, the culmination of a month-long opening of the underworld, is a time for people to honour and commemorate their dead. Often called the Chinese Halloween, this festival is not as scary as it sounds and is actually a festive celebration of deceased loved ones more than anything else. To appease the ghosts outdoor entertainment and lavish feasts are offered to satisfy the restless spirits and to ward off bad fortune in their lives. Celebratory dinners are held, and shows and concerts such as traditional puppetry and Chinese opera take place on every street corner. 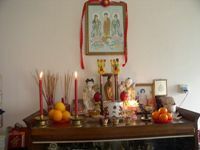 In addition, candles and joss sticks are lit in front of homes and small altars are set up where money, incense and paper goods in the shape of furniture and other everyday objects are burnt as an offering for the ghosts to use in the afterlife. Many Chinese people believe that one should not start a new business or move into a new home during ghost month as it is bad luck.